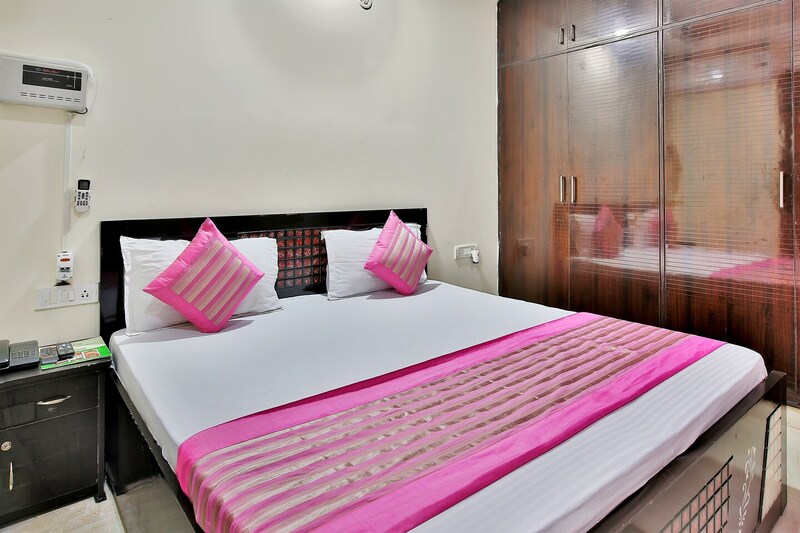 Hotel Green Palace is a modern budget hotel with well-lit and tasteful interiors, located at Ramphal Chowk, in Delhi. The property is close to Royal Residency Bus Stop, Dwarka Sector 9 Metro Station and Palam Railway Station. The rooms of Hotel Green Palace are trendy, with bright white walls and sleek furniture. Colourful bed linen adds to the appeal. The bathrooms are clean and have modern tiles. All the rooms of Hotel Green Palace are equipped with a television, a mini fridge, and an air conditioner. The bathrooms feature geysers. The hotel offers free Wi-Fi, CCTV security, and laundry service to its guests. There is also an elevator on the premises. Nearby eateries include Cafe Quince, The Bake Shop, Mutton Te Kukad and Pasta Xpress.